As much as I love living in Washington DC, I sometimes get an inkling to get away from the city and do some hiking. 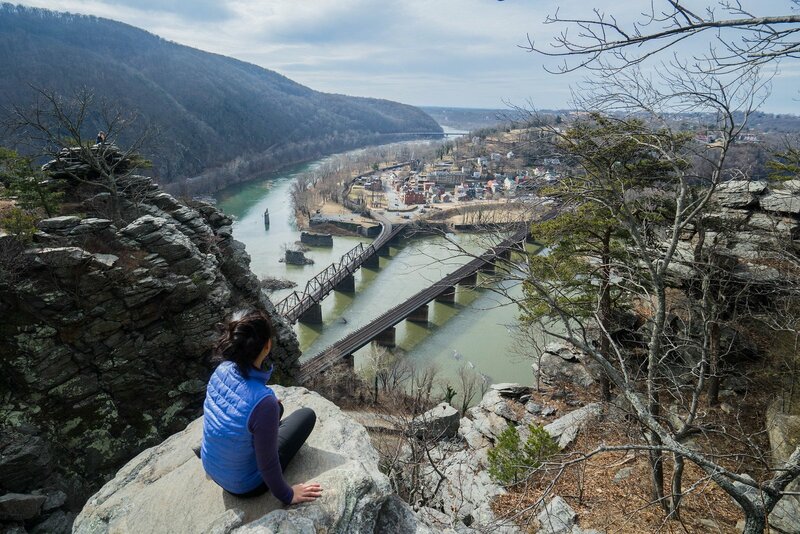 On a whim one Saturday, the urge to hit the trails hit once again, so we jumped in the car and drove to Harpers Ferry, a national historic park located about an hour away from the city. We decided to hike the Maryland Heights Trail, located across the river from the park, which was said to offer stunning views of the historic town below. Views? Hiking? Rivers? Count me in. All in all, I loved my experience hiking the Overlook section of the Maryland Heights Trail, so I thought I’d recount it for you all and give you all of the information we had so that you can visit this beautiful spot yourself! Leaving Washington, DC, we made our way to Highway 270, which took us right to the park. As we drove, the concrete sidewalks and gray buildings began to give way to rolling mountains and barren trees (it was wintertime). Once you arrive at the C&O canal, keep driving until you see parking on the right hand side. Grab any spot you can find, because they’re hard to come by! The trailhead is across the street from the canal and river side. On the Maryland Heights Trail, everyone starts on the same stretch, the Combined Trail. However, it eventually splits off into two sections: the Overlook Trail and the Stone Fort Trail. Read on to learn about each and decide which is right for you. This is the part of the trail that takes hikers to the beautiful viewpoint above Harpers Ferry. For less seasoned hikers, this is the shorter and easier of the two hikes, and takes 1.5-2 hours round trip. The downside of this trail is that it can get extremely crowded. To avoid the crowds, I recommend going early in the morning. Otherwise, there will be people everywhere you look. After a gradual uphill, you’ll eventually hit a fork in the road where the trails split off. For the Overlook trail, keep right. You’ll eventually hit some switchbacks, which will lead you to the Overlook viewpoint. From there, you can catch a glimpse of the iconic Harpers Ferry town, with its regal church steeple and historic bridge constructions, surrounded by the intersection of the Potomac and Shenandoah Rivers. PRO TIP: Once we got up there, we walked around to the different rocks and cliff areas and found a quiet place to sit, away from all of the people. While it wasn’t totally secluded, it was nice to get out of the main drags. If you’re looking for a place to sit for a while, try walking around to the left of the main view point for a slightly quieter experience. To return back to your car, you just follow the trail the same way you came back to the trailhead. If you want to try the more challenging trail, when you reach the fork in the trail, stay left into the uphill ascent. You’ll climb uphill for a bit, exploring the ridge of the mountain and the surrounding Civil War batteries. Eventually, you’ll end up at a staircase. That staircase will bring you into the Stone Fort, which is the namesake of this trail. The Stone Fort was significant because it was occupied by Union troops from 1963 to 1965. This enabled troops to better protect Washington DC, and is known to be a reason for saving the capital city during the war. If you’d like to learn more about the history of the fort and surrounding areas, check out the NPS website. After you explore the fort, you’ll descend until you reach the combined trail once again. From there, turn left and walk the remainder of the way to the Overlook area. Once you’re done with the trail, you can either walk across the foot/train bridge or drive into Harpers Ferry National Historic Park. Take some time to roam around the town, ducking into historic shops and homes or grabbing a bite to eat at one of the many cafes and shops there. You can walk up to Jefferson’s Rock to see the beautiful views he claimed were “worth a trip across the Atlantic.” If you decide to stick around the park until the evening, you can try heading to another nearby trail for sunset or go on a guided ghost tour of this haunted area. As someone who loves the outdoors, I’m always looking for fantastic trails in the Washington DC area to hike and explore. Hiking the Maryland Heights Trail was the perfect day trip from Washington DC, and I’d go back again in a heartbeat. 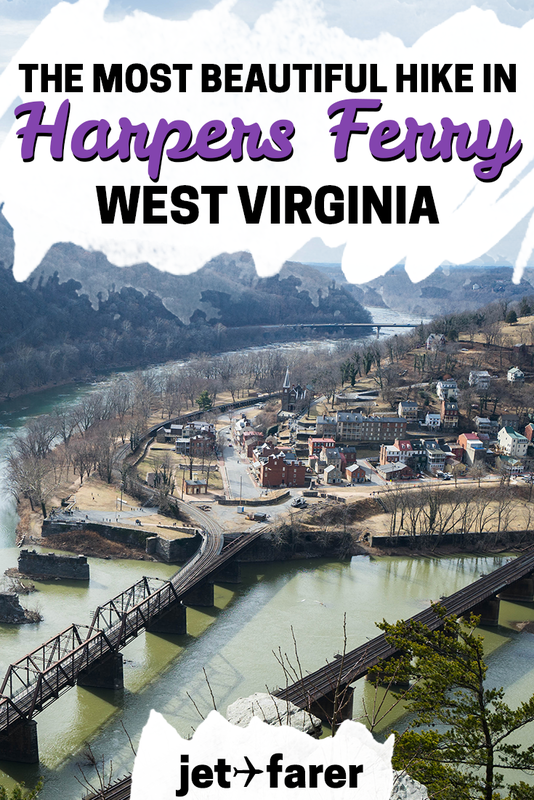 Harpers Ferry is a beautiful area to spend a day hiking, learning about American history, and wandering through the cobblestoned streets of the town. I’d highly recommend it as a lovely weekend escape from the city. Have you ever hiked the Maryland Heights Trail? What did you think?